Ka-52 Alligator is an all-weather attack helicopter in service with the Russian Air Force. Image courtesy of Alex Beltyukov. Ka-52 Alligator is a two-seat version of the Ka-50 attack helicopter. Image courtesy of Alex Beltyukov. Ka-52 Alligator is equipped with two Klimov VK-2500 turboshaft engines. Image courtesy of Maxim Maksimov. A Ka-52 Alligator attack helicopter flies during the MAKS 2007 air show. Image courtesy of Dmitry. Ka-52 helicopter can be operated at a maximum altitude of 5,500m. Image courtesy of Vitaly V. Kuzmin. Ka-52 Alligator is an all-weather attack helicopter operated by the Russian Air Force. Developed by Kamov Design Bureau (part of Russian Helicopters), Ka-52 is a twin-seat variant of the Ka-50 attack helicopter. "The first Ka-52 helicopter was rolled out in December 1996. The helicopter completed its first flight in June 1997." The Ka-52 helicopter can destroy enemy armoured and unarmoured ground targets, low-speed aerial targets and personnel at the frontline and in tactical depth. It is also deployed as a surveillance platform and aerial command post for a group of attack helicopters. The first Ka-52 helicopter was rolled out in December 1996. The helicopter completed its first flight in June 1997. The serial production of Ka-52 began in 2008 at Progress Arsenyev Aviation plant in the Primorye region of Russia. Russia plans to equip its proposed Mistral Class amphibious assault ships with Ka-52K helicopters. Ka-52K is a naval variant of the Ka-52 Alligator. In December 2010, the Russian Air Force’s 334th Tactical Deployment Centre in Torzhok received three Ka-52s. The twin-seat Ka-52 will serve in the air force as a special mission helicopter. The Russian Air Force began fielding Ka-52 helicopters in April 2011. The Ka-52 will replace the Ka-50 Black Shark fleet that is in service with the Russian Air Force. Ka-52 incorporates a slightly modified design of the Ka-50 helicopter. The helicopter features a wider nose and an extended fuselage due to its twin-seat cockpit. The commonality of the airframe, components and systems of the two variants is about 85%. "The Ka-52 will replace the Ka-50 Black Shark fleet that is in service with the Russian Air Force." The helicopter has a length of 16m, height of 4.9m and main rotor diameter of 14.5m. The maximum take-off weight of the Ka-52 is 10,800kg. The twin-seat cockpit accommodates two crew members in side-by-side arrangement. Both the crew members are seated on identical K-37-800M ejection seats. The modern glass cockpit is equipped with a head-up-display (HUD), four SMD 66 multifunction displays, helmet-mounted sight display, image intensifiers and a GPS receiver. The helicopter also integrates a FAZOTRON cabin desk radio-locator and navigation and attack system for helicopters (NASH). In September 2012 Russian Helicopters, a subsidiary of Oboronprom, signed a long-term contract with Ramenskoye Design Company (RDC) for deliveries of avionics equipment. As part of the contract, RDC is responsible for the supply of avionics packages for Ka-52 attack helicopter and Ka-52K advanced ship-based variant between 2013 and 2020. The starboard side of the fuselage is fitted with a NPPU-80 movable gun mount installed with 2A42 30mm automatic gun. The six wing-mounted external hardpoints can be attached with different combinations of weapons. The hardpoints can carry VIKHR anti-tank guided missiles (ATGM), ATAKA missiles with laser guidance system and B8V-20 rocket launchers for 80mm unguided S-8 rockets. VIKHR anti-tank missile has a range of eight to ten kilometres. 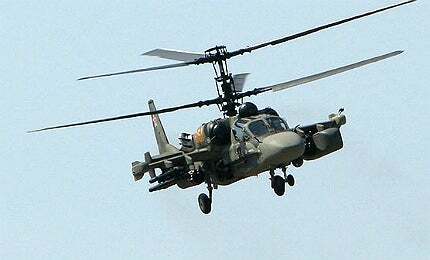 The Ka-52s can also be armed with IGLA-V anti-aircraft guided missiles. The Ka-52 helicopter is fitted with a mast-mounted radome housing a Phazotron FH-01 Millimeter Wave Radar (MMW) radar with two antennas for aerial and ground targets. The countermeasures are supported by active IR and electronic jammers, radar warning receiver (RWR), laser detection system, IR missile approach warning sensor and UV-26 flare / chaff dispensers in wing-tip fairings. The Ka-52 Alligator is powered by two Klimov VK-2500 turboshaft engines driving two coaxial contra-rotating main rotors. Each engine produces a maximum take-off power of 2,400hp. The engines are equipped with a new full authority digital control system (FADEC). The Ka-52 helicopter can fly at a maximum altitude of 5,500m. The maximum and cruise speeds of the helicopter are 300km/h and 260km/h respectively. The helicopter can climb at a rate of 12m/s. The Ka-52 has a practical flight range of 460km, while its ferry flight range is 1,110km. The Sukhoi Design Bureau of Moscow, Russia has developed the Su-47 (previously called the S-37 Berkut or Golden Eagle) fighter aircraft, which first flew in September 1997. A long-range supersonic interceptor aircraft, the MiG-31 Foxhound, a two-seat aircraft developed principally for the Russian and Kazakhstan Air Forces, was derived from MiG-25 Foxbat.